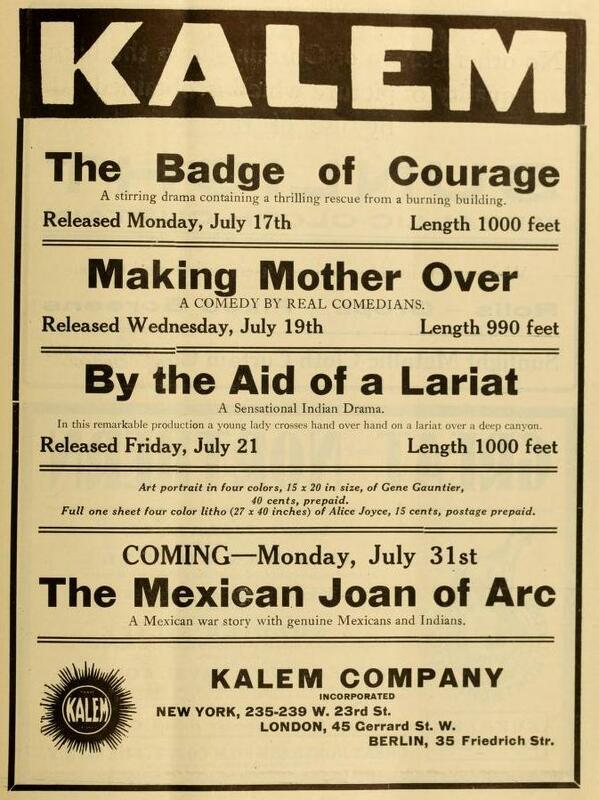 Por eso, no es del todo creíble la publicidad de la Kalem que presumió en The Moving Picture World (23 de julio de 1911) de haber filmado en México su cinta The Mexican Joan of Arc. 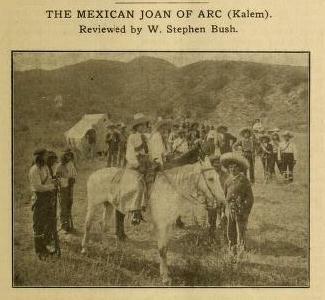 A mediados de 1911 se realiza una película que tiene diferencias con las otras que se hicieron sobre la Revolución Mexicana en esa misma época. Vale la pena comentar algunas de sus características porque está basada en un hecho real y ambientada con los requisitos indispensables del exotismo, además de que no entra completamente en los esquemas imaginarios que son redundantes en casi todas las películas que se hicieron sobre el tema. Esta cinta se llama La Juana de Arco mexicana y fue realizada por la Kalem en julio de 1911, dos meses después de la partida de Porfirio Díaz. En ella se hace alusión a la crueldad y a la injusticia del gobierno de Díaz y se retoma el caso real de una mujer que se levantó en armas contra el gobierno para vengar la ejecución arbitraria de su esposo y de sus hijos. La Juana de Arco mexicana es una narración que alcanza una demensión épica excepcional, comparándola con las películas que se habían hecho sobre el tema y con las que se harían en los siguientes años. El melodrama de la mujer que pierde a su familia y el ambiente exótico son rebasados por la fuerza dramática con la que se representa el levantamiento popular. 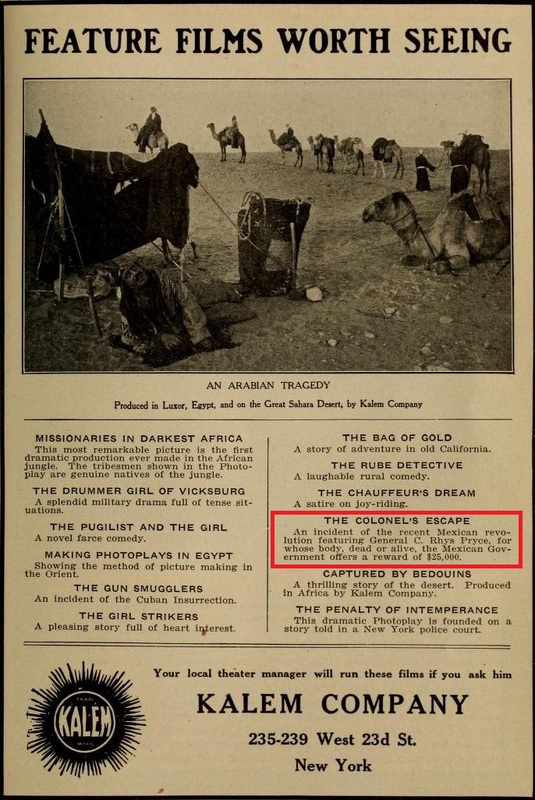 The great empire to the south of us has often in the past been the theater of bloody and stirring events, but its annals hold no record of a more truly elemental tragedy than is told in this silent drama. It is a true story, well attested by the Mexican press and authentic American news dispatcher. A plain woman of the people, content to be nothing more than a faithful wife and loving mother is suddenly plunged into a fearful anxiety for the lives of her husband and sons. President Díaz, bold in his youth, resolute in his prime and bloody in his old age, suspecting like the half-mad emperors of old Rome danger where there was no danger, causes through his “jefe politico” the arrest of Talamantes and his two sons. They are torn from the bosom of their family and rushed to a “corte,” nominally a court of justice, but as a matter of fact nothing but a legal convenience for the designs of the despot. The dictator’s tool, one Zefas, is drunk, when Talamantes and his sons are arraigned before him and even in his drunken mood he condemns father and sons to death. The sentence is promptly carried out, even while the wife and mother pleads for mercy or delay with the drunken military judge. The halting utterances of the judge make her understand the frightful truth, that she is a widow and a twice-bereaved mother. The widow swears to be avenged upon Zefas and his master and becomes indeed the Nemesis of the wretched Zefas and contributes not a little to the success of the insurrection and the dethronement and the thinly disguised Hi the tyrant Díaz such in very few words is the story. It possesses a tragic power greater than that of “Joan of Arc.” The latter was impelled by patriotism, moved by heavenly visions to come to the aid of her king. It was not the woman, not the sweetheart, wife or mother that stirred within her when she confronted Talbot and Salisbury, but the Frenchwoman, the loyal subject of the French king. As a motive for action, patriotism, however laudable, cannot for a moment compare with the far deeper and more primitive and elemental emotion of wife’s and mother’s love. A woman roused and determined and spurred on by the wrongs the has suffered as a wife and mother rises at once to heroic size in the eyes of any audience and gives the play a power and dignity, which, it would otherwise not possess. The widow Talamantes eared nothing about the insurrection in itself, she uses the insurrection as a means to an end and thereby lifts the whole story into a higher plane of dramatic force and interest. What must otherwise have been a common tale of war and politics now becomes a tragedy in the truest sense of that word. There is so much other merit in this film, as will appear presently, that it would rise above the level of the ordinary, even if the part of the widow Talamantes had not been taken by a competent and gifted artist. 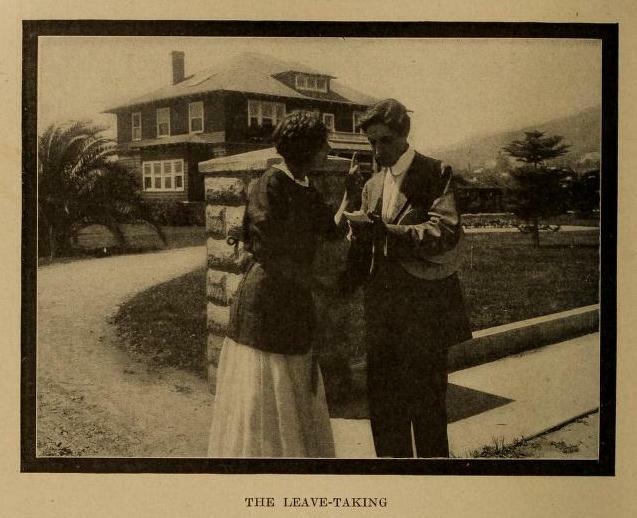 As a matter of fact, however, the actress, Jane Wolf, who essayed this difficult role, measured up to every inch of her responsibilities. Her great test came with the scene in the “corte federal.” which she entered as a half-broken, pleading woman and left a few minutes afterwards like a very goddess of vengeance, “filled to the top with direst cruelty.” None but a chosen votary of the histrionic art could have done the work she accomplished. When the awful truth at last dawned upon her and she realized that husband and sons were dead she manifested in all her despair and fury that control and poise, which is of the essence of art. Her oath of vengeance was a consummate piece of acting. All other characters in the play were of course subordinated to that of the widow Talamantes, but whatever she needed of capable support was well supplied by the rest of the company. 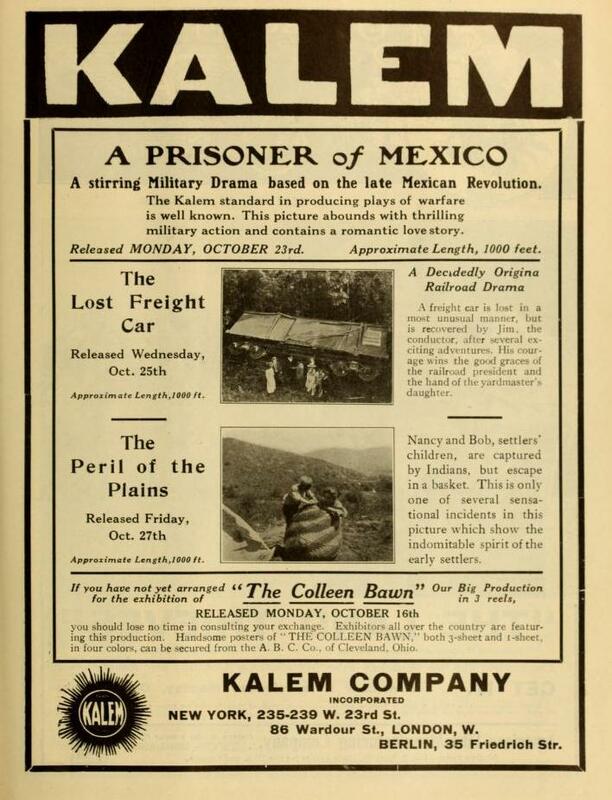 The latter, it must be specially mentioned, were not the regular Kalem players, but all Mexicans, half-breeds and Indians. 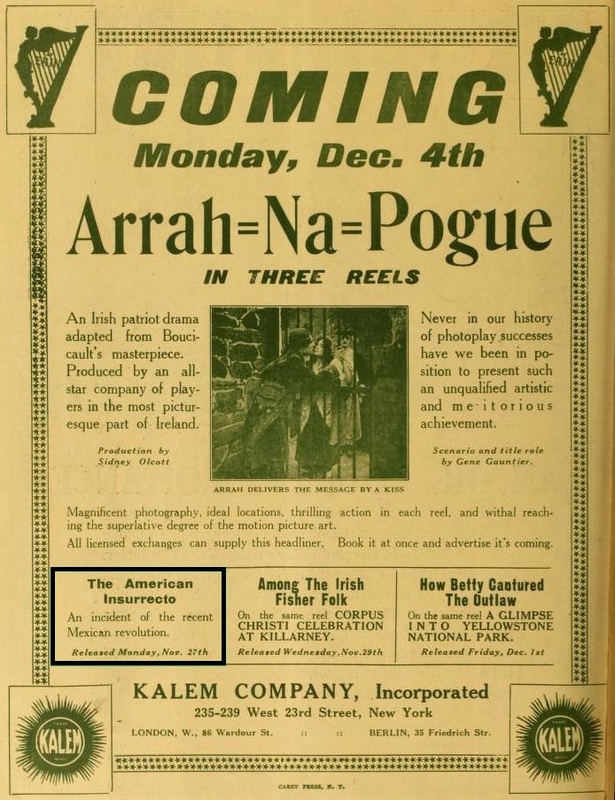 How much more eloquent the Southern races are with their faces and their hands and fingers than we of more Northern origin was again illustrated in the course of this reel and it was a most pleasant relief to see real Mexicans, real half-breeds and real Mexican Indians after the caricatures that nightly parade through the films of the cheaper sort. The play possesses an uncommon historic value, first because it deals with an authentic contemporaneous event, and second, because it shows us the real Mexico as it exists to-day. All the pictures were taken on Mexican soil in the very neighborhood in which the actual scenes in the tragedy, as reported by the newspapers, had taken place. It is a way of teaching history and geography which cannot be surpassed. For such an education, conveyed in such manner children and grown people will alike be thankful. We know to-day but little more than our grandfathers about the land of the “conquistadores,” but with the modern moving picture this will soon be changed. One word more about the last scene. When vengeance has been wreaked on Zefas the title tells us, and so does without words the widow Talamantes: “Now I will go back to my people.” It is a fine dramatic conclusion, which no audience can fail to perceive and appreciate. 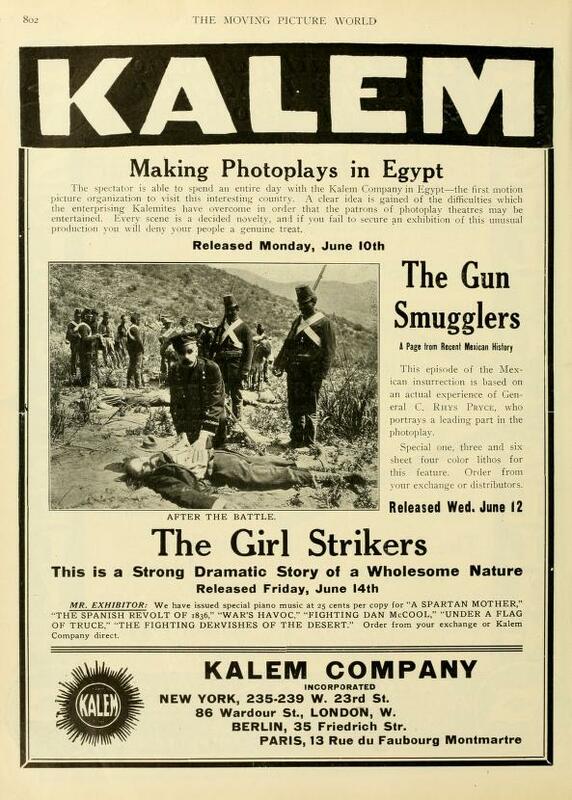 También en The Moving Picture World, pero del 29 de julio de 1911 (Vol. IX, No. 3, p. 223) apareció la siguiente breve sinopsis; sin embargo utilizan un nombre distinto para el personaje del oficial federal: Coronel Cephis a diferencia de la reseña anterior donde utilizan Zefas. Señor Talamantes and his sons are arrested as insurrecto suspects. 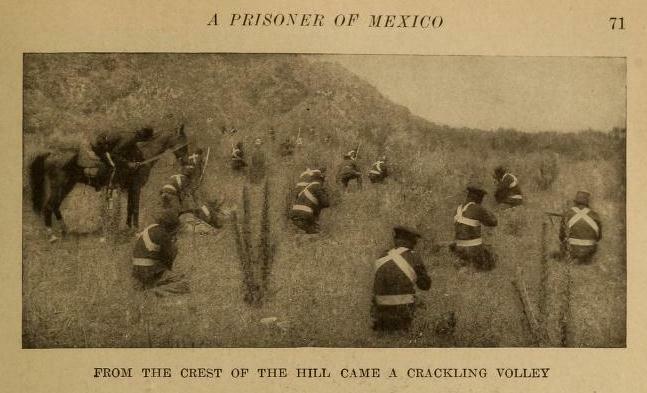 Colonel Cephis, of the Mexican regular army, condemns them to death without trial. The Widow Talamantes swears retribution for the unjust death of her husband and sons. 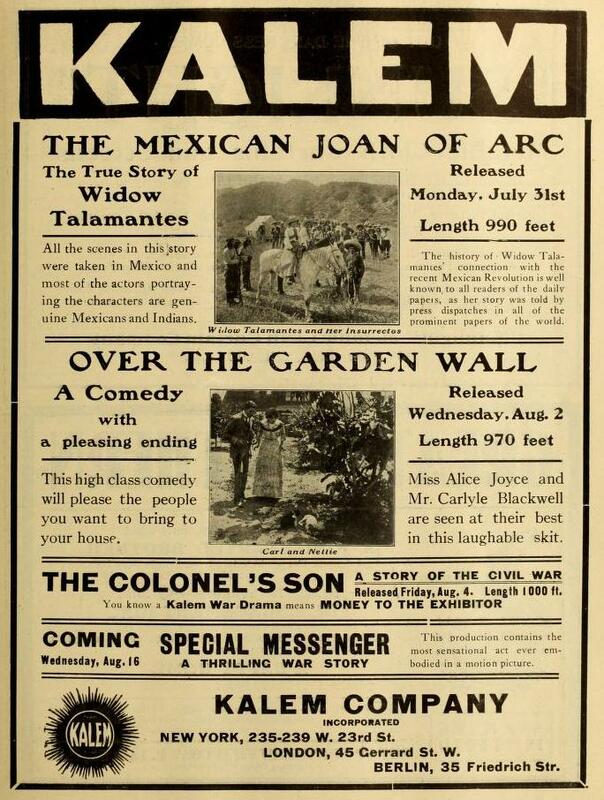 Carrying out her plans, the widow organizes a company of Indians and Mexicans and joins the insurrectos. 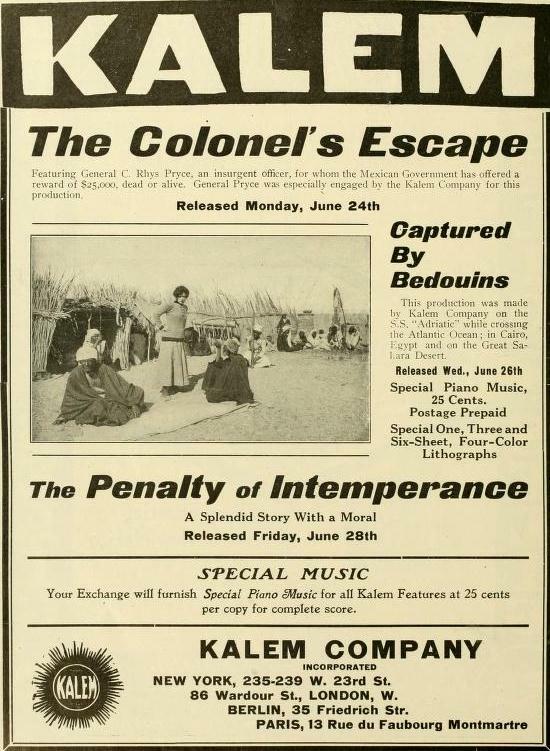 The Widow Talamantes sends a disguised insurrecto to Colonel Cephis’ headquarters, who induces the Colonel to spend the night in a small Mexican hotel. 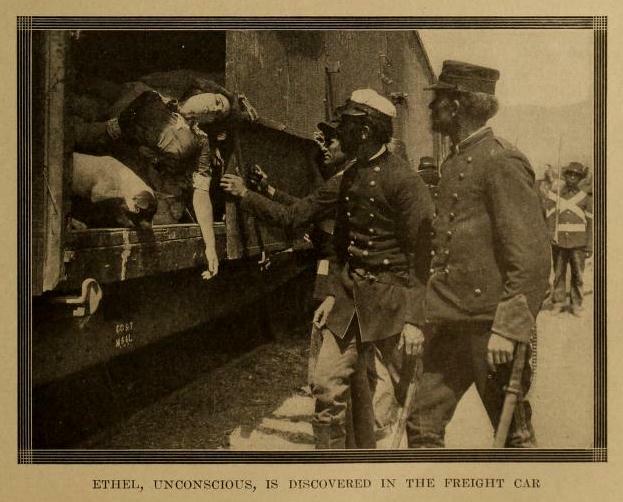 The next morning Colonel Cephis awakes to find the town in the hands of the insurrectos. 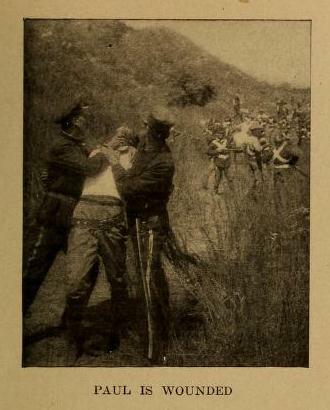 While attempting flight he is ambuscaded by the Widow Talamantes and her little band of insurrectos and captured. 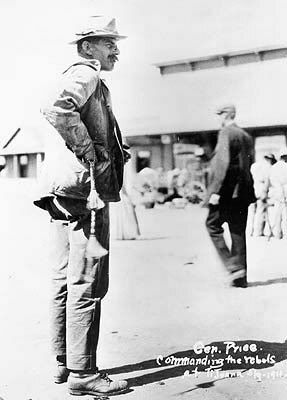 A drum-head court martial quickly condemns him to death. The widow’s mission being completed, she returns to her people. 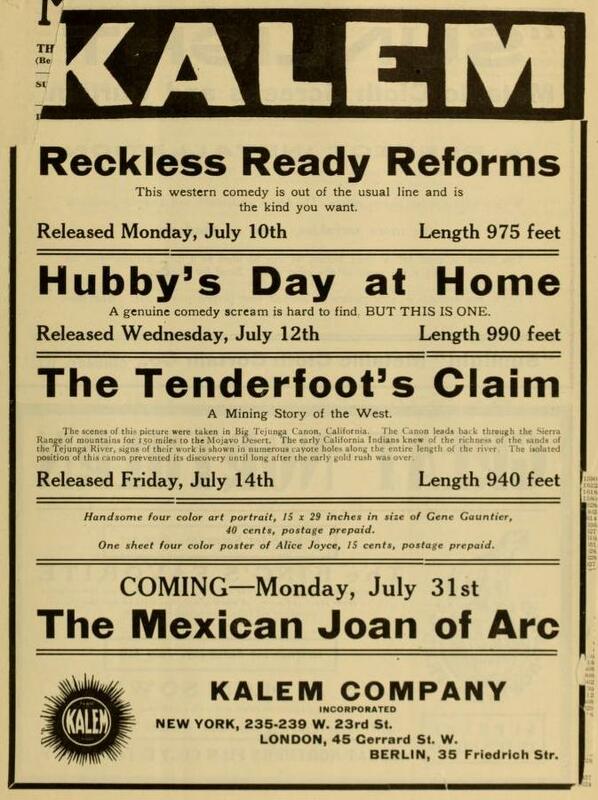 The Circuit Theater, of this city [Seattle], secured Kalem´s Historical Drama, “The Mexican Joan of Arc,” and ranks as one of the best productions Kalem has turned out. Manager Levy states they play to very good houses during the four-day stay.